We are all born not knowing and not thinking we are immortal. But by some divine plan, many come to know and to think they are immortal. Yet, many also learn to think they are only mortal and that there is nothing more to life than what is visible. Any hopes or wishes to prolong the joys, and less so the pains of life, fall in the realm of imagination. Blessed, however, are those who live and eventually face death knowing and thinking they are, in truth, immortal. Yes, there is some irony in the last statement. Death seems to close all arguments against immortality or eternal life. But that is true only for those who never heard of a resurrection. Christians stand unique in the whole of human history as people who rejoice and even suffer because of that assurance. For unless we come face to face with our own mortality, we will not try to hold on to the possibility or the certainty of eternal life. Seeing how some people face their own mortality inspires others to live life with greater courage and hope. This is the great lesson one derives from having known Joel Castillo, whose struggle with cancer, brought about changes not only in his own life but also among those who knew him so well. A few months before learning he had cancer, he was still happily going about his role as father, as husband and as partner to Rose Tuazon- Castillo in their thriving LGO Company and social-outreach projects. One can sense the driving enthusiasm he had for adventure and fellowship with his beloved children, close siblings and intimate friends. It seemed Joel had not enough time to savor the joy of living as well as the opportunity to spread that joy around to as many people as he could. Yet, he also had his missteps, as is always the case when we go about walking among many people. We all live in the middle of everything else; and whether we like it or not, we have to find the balance and strive to preserve our own identity. Indeed, such petty issues did not faze Joel and Rose from pursuing their noble task of blessing others through their good hearts. In the end, they found a way of spreading cheer and material assistance to many more people. Yet, the time would come when the challenge of proving one’s identity goes beyond what you can do in life and into what life does to you. In Joel’s case, it was his ultimate battle with sickness. 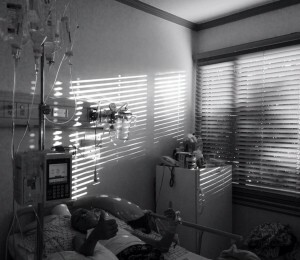 The many therapies and blood transfusions took their toll on his battered body. Yet, in spite of it all, his spirit remained indomitable. He put up a good fight. His ever-warm smile and firm voice never failed to prove it was the same old Joel who was in control of his path to his own destiny. And so, even in his own departure from among our midst, he left behind his wishes for his family, for his friends and for himself – wishes which those of us who remain now have the opportunity to accomplish not just for him but also for those he treasured in life. And so, when we bade farewell to Joel, the moment was made less tragic as heaven itself commiserated and poured both refreshing rain and renewing sunshine to celebrate his life with us. For such is mortal life: light and shadow, joy and pain, triumph and failure, life and death. But in the end, immortal life will prevail because faith in Jesus Christ gives us the victory. From what we heard about his last moments, Joel made his peace with His Lord and humbly surrendered his fate into His hands. Young as he was in his short journey upon this Earth, his exemplary influence upon those who knew him well will remain and live on as his lasting legacy to the future generation. 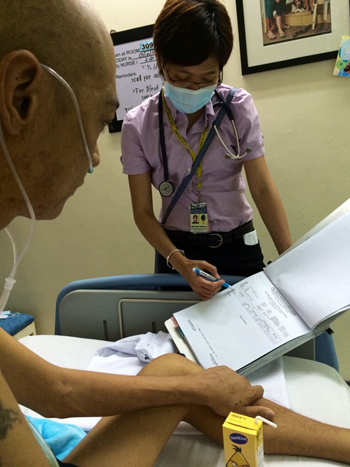 Rose Tuazon-Castillo, the bereaved wife of Joel, extends her deep gratitude to those who had provided support for Joel’s financial, medical and emotional needs during his treatment. Knowing there were many people who joined them during the campaign for Joel’s recovery made the pain and anguish much more bearable. And even now, for Rose, Jared, Jansen and Justin and Joel’s extended family, the loss of a beloved is greatly assuaged by the many souls who expressed how they were touched by Joel’s life. Farewell, Joel: Till we meet again in that perfect place in our perfect form – spirit and body. In connection with the ongoing fundraising campaigns, we would like to express their appreciation for Diorella Printing Shop for donating 2,500 posters of Joel’s AB+ blood solicitation drive for his transfusion needs. Likewise, their appreciation and thanks go to Remus Printing Shop of Olongapo City for donating Castillo-Family-Picture Thank-You postcards for those who have purchased t-shirts. And, finally, the Castillo Family would like to express their thanks and appreciation for the Subic Bay Chamber of Commerce for spreading the campaign en-masse to its members. A giga thanks to all these wonderful heroes who have selflessly made time to help a respected family of Sto. Tomas. For the information of all, Joel and Rose Castillo put up a company to employ many young and dynamic IT professionals in Subic and eventually launched a foundation (IROG) to provide scholarships to the youth in Sto. Tomas, Subic. Please check out this site Isabelita Rosueta Organization (IROG). As fate would have it, Joel’s condition has turned the table around and the Castillo Family now needs the assistance of others. The outpouring of help so far only shows that a good deed does come around and return to those who have given plenty of it to others. 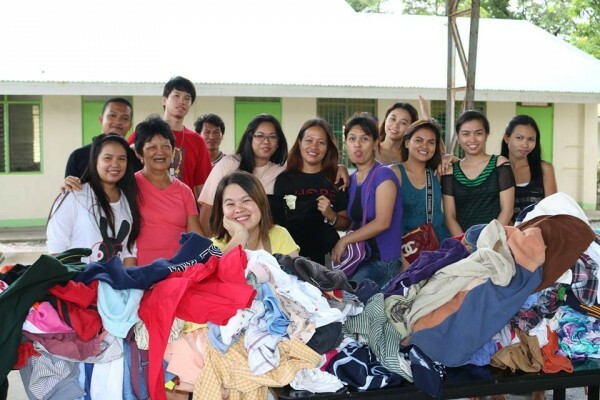 Seeing the joy and enthusiasm of Isabelita Rosueta Organization beneficiaries during their Christmas and many yearly activities is only half of the picture as the faces of those people who compose IROG likewise show the deep joy and sincere love of those who give. So, whether you are in need or you are in a position to give, the joy is one and the same because we all share in the wonderful blessing of life from Heaven. We have received the best from our Maker; let us then share our best to others as much as we can. Only then can we say that we have and we know true love. God truly provides through individuals and people to whom He has given abundantly. Miracle happens everyday! Close to impossible but its not! - with such resourceful friends, ever supporting bros' & sis', and a faithful God, how hard can it be? In connection with the ongoing fundraising campaigns), we would like to express appreciation for Diorella Printing Shop Olongapo City for donating 2,500 posters of Joel’s AB+ blood solicitation drive for his transfusion needs. Day 31.Think Positive! Stay Positive! Day 31. The brilliant concept that the glass is neither half-empty nor half-full, like life is both - contains happiness and sadness. Happy as the cancer cells is down to 3% after the 3rd chemo, and sad as we cannot proceed with the transplant till we treat his weakening heart and rhythm disturbances first. Times like this, when life gets tough, and things will look like they’re not going to work out as planned, let’s live by hope and faith - everything’s going to be alright. This is a continuous battle - i need more CHAKRA! Think Positive! Stay Positive! Tags: day 31.think positive! stay positive! A Fundraising Campaign for A Friend With Leukemia - The last time I've seen the same group of people go on a 5-hour trip, it was for a Christmas party. The situation couldn't have been more different this time around. A roving van can be heard calling out to people to "come check out the garage sale". 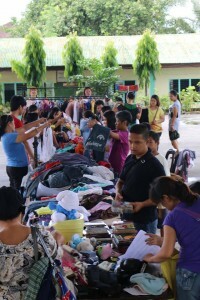 A group of friends and coworkers were busy setting up shop in the covered court of a school. They got several tables in a row with various stuff on them - clothes, books, bags and toys - priced anywhere from 10 to 800. You can imagine then how exciting it was for customers who would eagerly plunge into each mountainous pile looking for something they like and then discover that they could have it for a mere Php 10. Sometimes, they'd haggle for a bit and then leave even more satisfied with themselves. Classic ukay-ukay. I could not say the same for the staff who were manning the makeshift store though. It was hardly exciting: waiting around for people to come, beckoning loiterers in and chatting up those who are checking out the merchandise. So what would make them work on their only 2 days of rest from a whole week? They were not in it for the money. (If anything, they're actually spending their money!) They did it for someone they care about. See, it was a special kind of garage sale. It's for a cause. 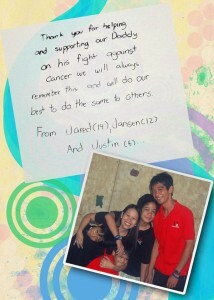 Several weeks back, they learned that their friend's husband has been diagnosed with leukemia. I know leukemia sounds unreal to most of us. It was one of those serious illnesses that we just know because we've seen it in the movies or read about in books. Just like when the TV guys need one character to die in a prolonged and dramatic sort of way. No wonder you'll find it strange when you suddenly get confronted by it in real life and you'll be left with a realization that, Jeez, it does happen in real life. And when it happens, sometimes mere sympathy might not be enough. Like anything else, it's mainly a question of money, what with the hospital bills, medication and an extremely expensive operation. And knowing that their friend obviously needs help, they came up with this cool plan to do a garage sale in order to raise funds. They opened their closets (or their relatives' and friends' closets), took out stuff they could sell and bargain-priced them. The garage sale (for a cause) was born. At first, there was only a slow trickle of customers but it became a steady stream before the sale was over, and the coins kept coming in. (I suspect that was perhaps owing to the ridiculous price cuts made on some of the items -- a stuffed toy priced at 150 was down to 75 without the customer even trying. The as-long-as-it-turns-to-cash strategy no doubt.) When they closed up shop that weekend, they listed almost Php 20,000 in profit and they donated all of it. Not bad for two days of operations. I guess there's something about helping someone in need that makes usually stingy persons suddenly willing to part with their money - and feel good about it. So, they have Php 20,000 down and Php 3 million more to go. Sounds like they need some big miracle, huh. But with such resourceful friends and a faithful God, how hard can it be? 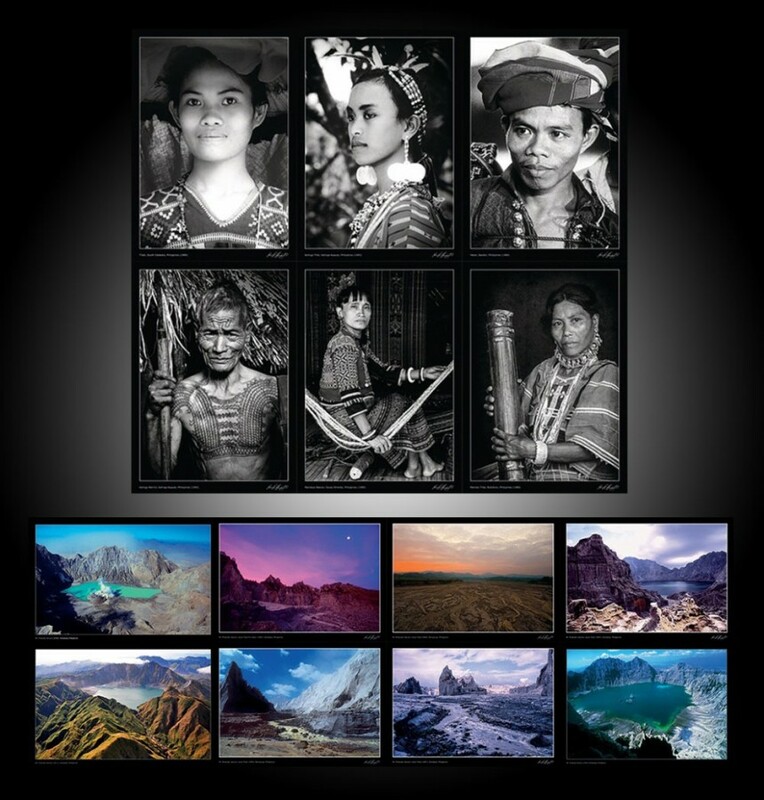 Please support his Fine Art Prints Fundraising Campaign and will get the following: Any one (1) of the below photo which will be printed on 24"X 16.5" high quality 189gsm archival paper stock, using UV resistant inks (i.e. very stable and suitable for decorative purposes). In addition to being titled, dated and signed digitally on the front (bottom), Photographer Kevin Hamdorf will personally sign them on the reverse side. Thanks to a dear friend Kevin Hamdorf for the full support!!! 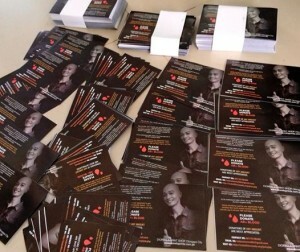 Please email (helpustosavelife@gmail.com), or submit the form at http://isabelitarosueta.org/joel.php to order. 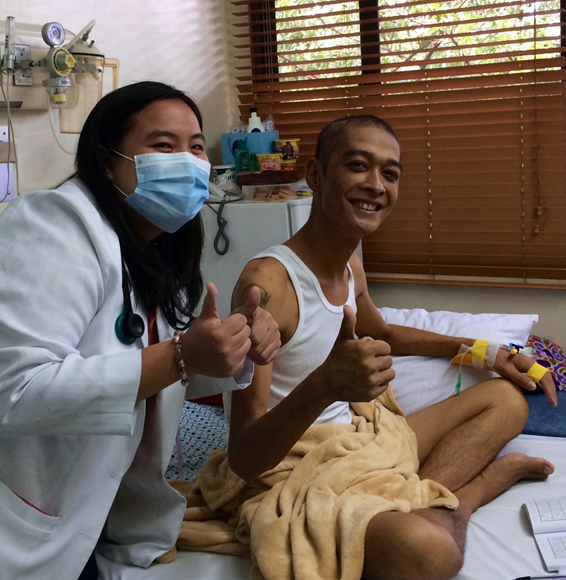 Acute Myeloid Leukemia patient from the Philippines seeks help - Only 30 percent of patients who need a bone marrow transplant have a matching donor in their families (Thanks God we have a MATCHED DONOR IN THE FAMILY!). The remaining 70 percent must hope that a compatible stranger can be found using the national registry. Only 2 percent of population is on the national registry. A significant number of those on the national bone marrow registry cannot be located or will not donate when asked to do so. The percentages of donors who are available and willing are: 65 for Caucasians; 47 percent for Hispanics; 44 percent for Asians; 34 percent for African-Americans. At least 1,000 people die each year because they cannot find a matching donor. 70 percent of marrow donations use peripheral blood stem cell apheresis. 30 percent of marrow donations use the traditional method of putting a needle in your hip. Donating bone marrow is safe: More than 35,000 people have donated bone marrow to a stranger without a single donor death. For us, it is challenge accepted. We looked at it in a different perspective. We believe that He is using us to become an inspiration to others. This is the reason why He gave us this cross to carry. He wants us to show others how to face problems together and to show others how HOPE, LOVE and FAITH can solve anything. Acute Myelogenous Leukemia, AML, is a type of cancer that affects the blood and bone marrow. Our dear love one is currently fighting against AML. He is that kind of person who loves unconditionally, who gives without asking anything in return, and who helps without expecting a payback. There is incredible joy in making others happy, despite our own situations; he is that kind of person. I run out of words to describe how good this person is so instead let me share you this video, http://m.youtube.com/watch?v=ZYSBdz31gPA&feature=youtu.be. You can also help through our fundraising, check https://www.facebook.com/pages/APO-Shirts-for-Bro-Joel-Castillo/685847278129933 for more details. Many were shocked to learn that Joel Castillo, a close friend and associate, has been diagnosed with leukemia, a type of cancer which affects the blood. A resident of Sto. 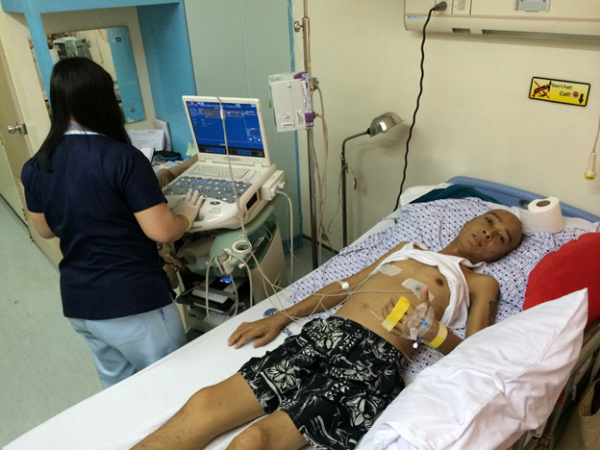 Tomas, Zambales, he is in need of Ab+ blood for his coming bone marrow operation. Having lost his good health for several months now, he remains hopeful and looks forward to reclaiming his good health by God’s grace. The value of anything we own or enjoy in life becomes more pronounced not just when we lose it but when we realize we can still function without it and have the greater opportunity to see the loss as a bridge toward a new and more exciting avenue we have never walked before. Blind people are known to compensate their lack of vision by their acuity in other senses, such as touch, hearing and smelling. Hence, many of them learn to become good masseurs, singers and musicians. In others, the loss may be temporary as in the case of an athlete who fails so many times but uses those failures – no , those moments of intense training – to gain greater self-confidence and the added ability to finally gain the gold medal. Health is one aspect of human life that causes us so much anxiety and concern, in most cases. Losing the ability to live life to the fullest because of illness can bring many of us into fits of despair and helplessness – even hopelessness, at times. Yet, many have accepted the reality of such moments as gifts for attaining personal growth and greater commitment to our Giver of Life. Hence, people with various physiological challenges form groups or clubs to raise awareness for their ailments and raise funds for the care of people with the same conditions. Today, one of the best spokespersons for Parkinson’s Disease is the Hollywood actor, Michael J. Fox, himself a victim for many years now. Since he acquired the illness, he was ceased making movies and uses much of his time speaking in favour of people who have it and for raising awareness of the needs of such patients. Like many who suffer from physical challenges, Michael waits for the time he can have a second chance to bring his past “back to the future”, so to speak. Second chances are not limited to having only one single choice but many at times. We have had friends who shifted to many courses in college until they finally finished one even after many years. Or friends who changed jobs until they came upon what they really loved doing, being an artist, a farmer or a photographer. For Joel Castillo, his choice at the moment is simply to go back to doing what he loves doing, which is to be with his family and friends reaching out to the less fortunate in his community and other neighboring communities in Zambales (http://isabelitarosueta.org/) (Please see the video that Joel helped produce for APO at this link. --- https://www.youtube.com/watch?v=ZYSBdz31gPA) Joel has Acute Myeloid Leukemia and is now in the process of undergoing a bone marrow operation. Life is so short ‘ika nga! So I will take the opportunity to share one of the good community services and last few activities I was able to participate in before I found out I had Acute Myeloid Leukemia. We tried so hard to finish the video, and at last here it is. Hopefully in the future, I will be able to come, see and join you Bros and Sis on our other projects in the FUTURE. So please help me... I might not be able to climb the hills yet, or walk on couple of rivers just to get to our destination, for sure I will be there! It runs in my blood, same as yours... May we always be! One can only imagine the pain and anxiety Joel feels going through life at this stage. But he is fully aware of what hope and prayers can do to anyone who has enough faith to take as much from life as possible and to give back to others as much as possible in return, no matter what the conditions are. His many second chances include not merely continuing the good work he has done for the community but also his God-given role as a husband, father and brother to his extended family relations. And to be the generous and adventurous friend he is to his fraternity mates at Alpha Phi Omega. And add to that still his other prime role as partner-in-business, not only in life, his diligent and caring wife of many years. Joel’s vision of a better life for others remains even if his condition is not something anyone would want to have. He needs our prayers and our help to recover his health and to take hold of whatever second chances he can catch in the future. 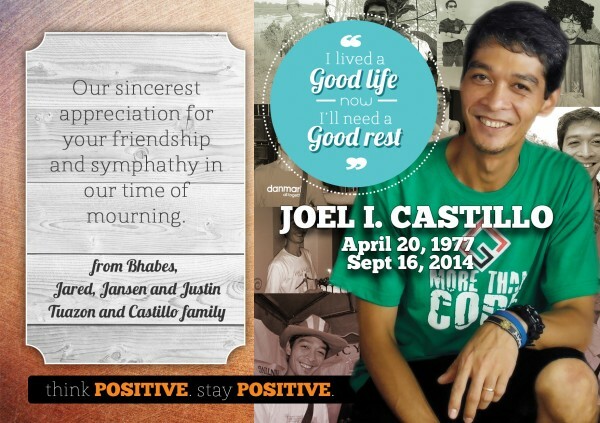 His wife, his relatives and his friends have started a Leukemia awareness campaign as well as a fundraising campaign to raise financial assistance (https://www.facebook.com/pages/APO-Shirts-for-Bro-Joel-Castillo/685847278129933) for Joel’s bone marrow/stem cell transplant (http://en.wikipedia.org/wiki/Acute_myeloid_leukemia) operation. He also needs Ab+ blood for his blood transfusions, not to mention your prayers for his full recovery. 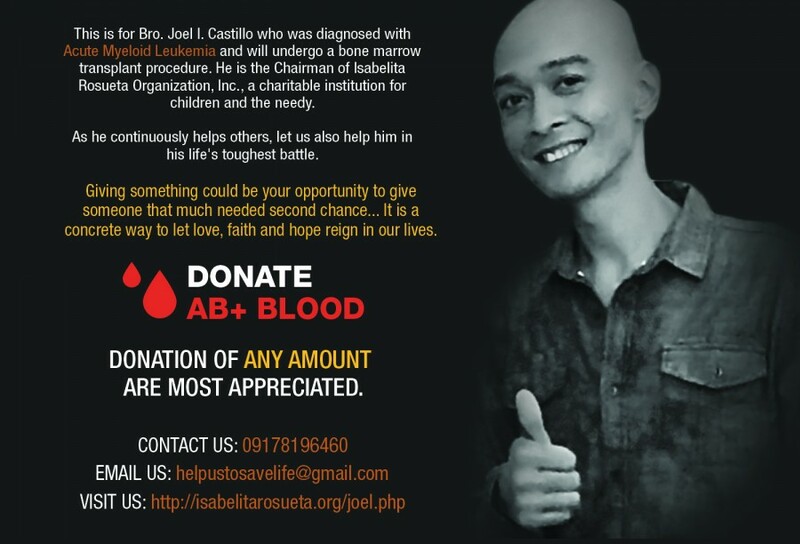 We appeal then on behalf of Joel Castillo: Please donate blood. Be a hero and save a life. Giving something could be your opportunity to give someone that much needed second chance. It is one concrete way to let love, faith and hope reign in our lives. chrisbelgira23 — Miracle happens everyday! chrisbelgira23 — Day 31.Think Positive! Stay Positive!